Be Our guest! Those 3 words together will always make a true fan sing. I LOVED watching Beauty and the Beast as I was growing up even though I was somewhat petrified of that terrifying Beast. It's a Tale as old as time and with the Beauty and the Beast 25th Anniversary edition Blu-Ray™ of the movie hitting stores on Sept. 20th, it's only right I offer you a giveaway! Why stop there? I'm also giving you a fun Belle Inspired costume and Belle Inspired Hairstyle idea for your little Beauty all under $25! 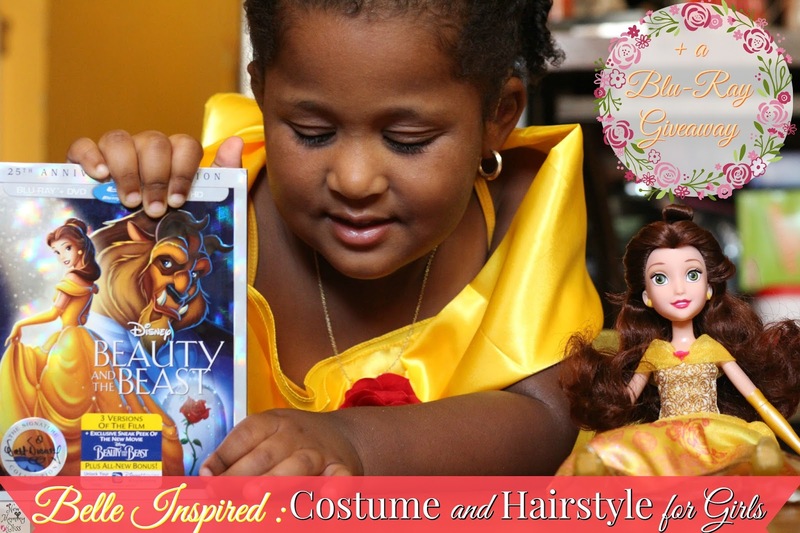 We were provided with a $20 Giftcard and challenged to create a fun Belle Inspired look for kids in honor of Disney's Beauty and the Beast 25th Anniversary Edition film. I decided to make this an under $25 challenge since I know we all want to have our little one's looking their best in their princess attire, but not have to give up an arm and a leg to do so! Gabby's Belle Inspired look is very simple to do and only cost me $19.98. (Full cost break down in video). 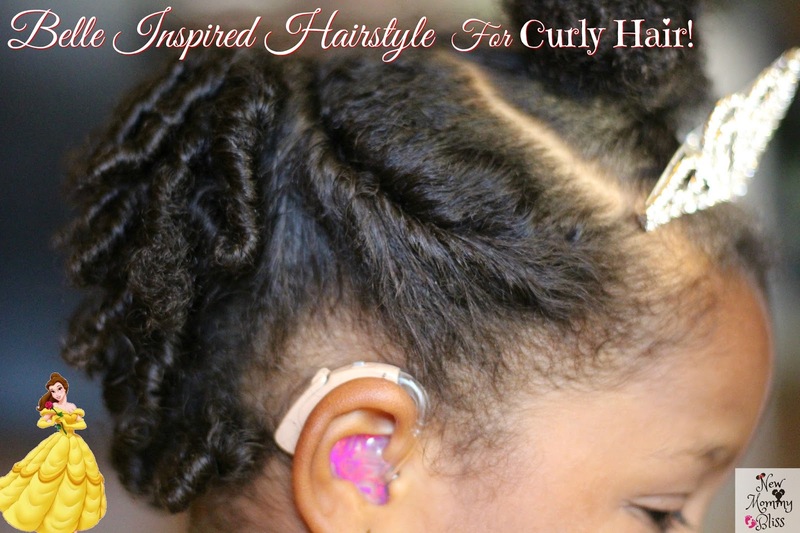 For our Belle Inspired Hairstyle, I specifically focused on curly hair. My daughter has short curly hair so I wanted to find something preschool appropriate to do with her hair that'll keep her in her innocence. The full and quick tutorial is in the video below... After you enjoy it, be sure to enter to win your very own Beauty and the Beast Blu-Ray™! I love watching Belle reject Gaston lol...and any scene with chip in it! My favorite part of the movie is when the beast turns human! Beauty and the Beast came out 25 years ago already? I can't believe it! I still treasure this movie just as much now as I did when it came out. The ballroom scene is my favorite. Wow! love the fairy stuff...the beauty and the beast is my favorite. Very nicely done. Is it 25 years already? Time really flies. I love the hairstyle of your daughter, she looks so lovely in the Belle costume. Oh how pretty! One of my twin granddaughters are so into Belle. She'll love this! I love the scene where he gives her the library and then it goes into the scenes outside with the birds and then the snow fight. So many great things in this movie. Thanks for the chance to win. i like the scene where belle wears the yellow dress and they dance. it's been so long since i have seen it that is all i really can visualize. What an awesome giveaway! Your daughter looks so pretty in that costume and love her hair! Nothing is more fun that princess dress up! I love that Disney released Beauty and the Beast again for the anniversary! She is such a doll in her Belle dress! I'll tell you, there's nothing more fun for a little girl than pretending to be a Disney Princess. Aw how wonderful. I love how cute she looks. Perfection. Love Beauty and the Beast! I can watch that movie over and over! She looks adorable! That dress and her hair makes me wish I had a little girl that I could do this also too. She looks like she was in love with what she was wearing. Well of course it's the singing of "Be Our Guest be Our Guest" because my girls and I have a blast singing together! OH and that hairstyle is so cute on your little girl I have to give it a try on my girls! My favorite part is when the magic has lifted the spell and everyone goes back to who they really are! Be our guest is my favorite part! Wow! 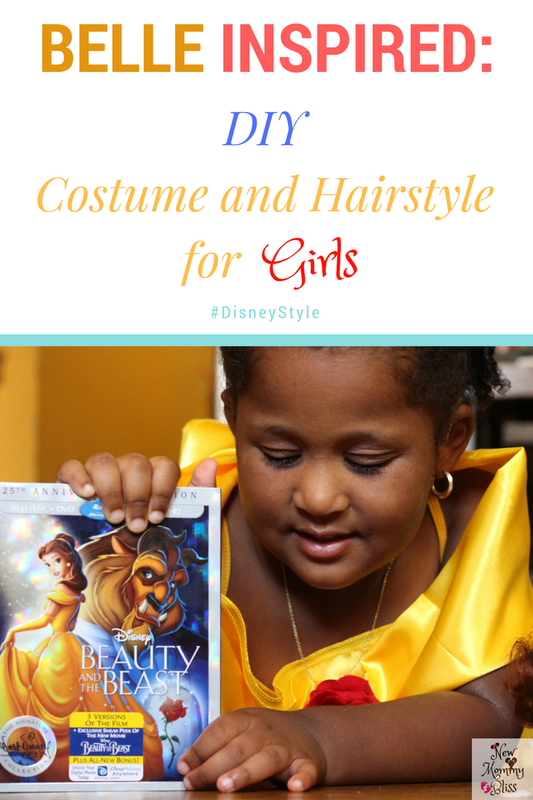 She's so pretty in her hairstyle, I love that you shared this Disney Belle Inspired DIY Giveaway! That's awesome. Beautiful little belle girl! I'm pretty sure that my niece would also love it! It such an awesome giveaway. I adore that Disney movie - its such a sweet one! And your daughter looks gorgeous with her costume and hair! She is darling, what little girl doesn't want to dress up like a princess - hair and all! Beauty of the Best has always been my favorite Disney movie. The music, the storyline...I just love it all. 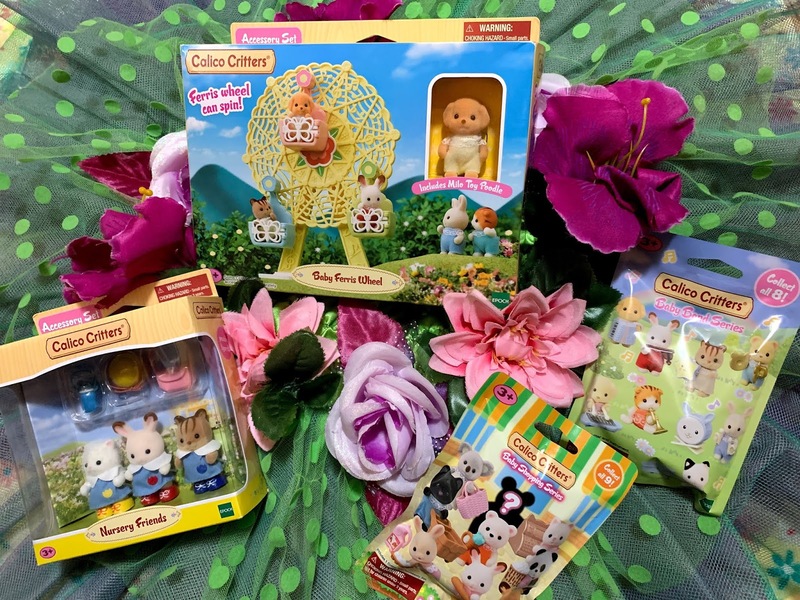 What a wonderful giveaway to spread the Disney magic! I like the part when the spells is broken and he turns back to human, because she realizes she loves him. I still can't believe it's been 25 years since the movie first went out! It's one of my favorite Disney classics. You have such an amazing daughter! Beauty and the Beast was my favorite Disney movie growing up! This is such a cute costume and she looks precious. I need to get this movie to watch with my daughter - and I'm sure she would love the costume too. My favorite part of the movie is when Belle and the Beast dance at his castle. She is adorable!!! My girls both love Beauty and the Beast it is a favorite movie of both of theirs, her hair turned out amazing! She is a very beautiful Belle :) Beauty and the Beast is a favorite Disney movie of mine and I look forward to watching it with my toddler one of these days. What a cute costume and she is adorable! We haven't really gotten into Beauty and the Beast in our house, but now that it's been released again I think we will have to try to watch it. I love when Belle and the Beast have their dinner and dance. The song is amazing and it is just a gorgeous and loving scene. Awe she looks so adorable. My Daughter and I loved watching Beauty and the Beast together when she was little. I can not believe it came out 25 years ago. I grew up with beauty and the beast. I would watch that movie everyday with my girlfriends playing dress up. Your daughter is beautiful! I love Beauty and the Beast! These pics are so cute, I wish my daughter still liked dressing up like a princess. Ahh! Beauty And The Beast was my all time favorite movie growing up! I just bought it for my kids and they like it a lot too. I thought I missed the boat with boys, but nope! I haven't shown my youngest daughter Beauty and the Beast yet. She loves princesses, so I know she'll love it. She makes a gorgeous Belle! I love the idea of behind the movie and looking at someone's true character. One of my daughter's favorite movies! This sounds like such a fun challenge. And I love the look you came up with! She is adorable! And I LOVE the Beauty and the beast movie! Oh what a princess Belle your daughter is. We all love the Beauty and the Beast here. Beauty and the Beast has to be one of my favorite Disney movies. I am in love with all of these ideas to celebrate the movie! Awwwww what a cutie!!!!! I just love beauty and the beast! My daughter just asked to be Belle the other day for Halloween! I love this movie! The part of the song about the grey stuff being delicious is my favorite. We ate it at Belle's castle this summer, and it was a very magical experience! Absolutely adorable! Belle was always one of my favorites growing up. She pulled it off well! So hard to choose on scene that I love when the whole movie is my favorite but probably the epic tale as old as time scene when Belle and The beast dance to the song. I loved watching Beauty & The Beast growing up. 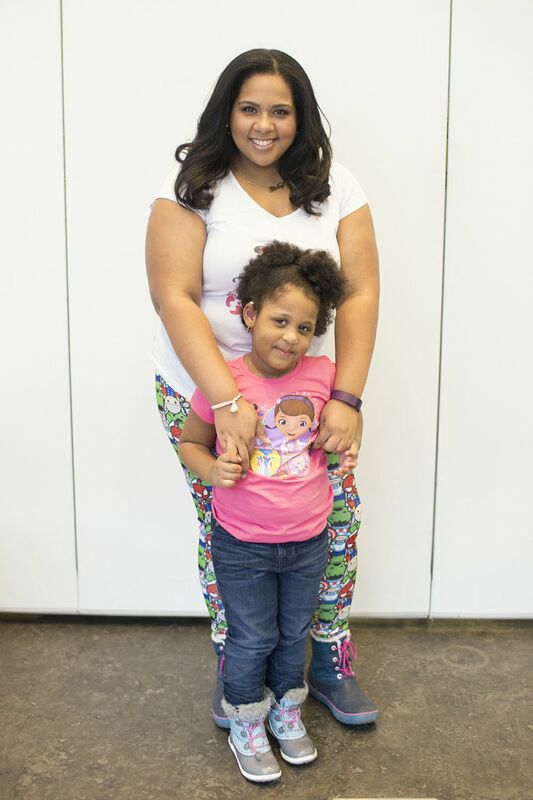 Loving how you styled your little one's curly hair. She's absolutely adorable! She's so pretty! Love the Belle inspired costume and the hairstyle. You nailed it! My favorite part is of course when they sing Be Our Guest! Your daughter is beautiful and that costume was a slam dunk! Awesome! This is so absolutely darling! I love Belle, she's my favorite princess. Well anytime Belle sings i love it but i would say my favorite part is when they are dancing together in the ballroom. I know this is right because it was one of my first son's favorite movies, but it still seems insane. Oh my goodness, what a beautiful little girl!! You did such a lovely job on the dress with such a budget and that hairstyle is so adorable! Love it! The Be Our Guest scene is a fave scene and song. She is so beautiful! What a nice costume for a very small price. This is SO stinkin' cute!!! I love that Beauty and the Beast is so big again - always a favorite in my house!!! What a beautiful princess ;) I love the ballroom dance scene. My favorite part of the movie is the scene where they sing "Be Our Guest". I also like the parts with Mrs. Potts voiced by Angela Lansbury. I love this Belle inspired look. Every little girl dreams of being a princess and dressing up like one too. I love the initial singing scene with all the dishes. My granddaughter loves her in her pretty dress and the singing. I like the part of the film when Belle ignores Gaston's attentions. I absolutely love the song Be Our Guest! I love when the sing it and all the dishes are singing and dancing. It has been my favorite part since I was a child! I love when they all sing Be Our Guest. I like the ballroom dance. How fun! Be Our Guest is the best! I can't believe this movie has been around for so long! I like when she is eating dinner and the dishes start singing. "Be our guest"
I like the ballroom scene where Beauty and the Beast are dancing! I like when the song Bee Our Guest is sung. Be our Guest is pretty memorable. I have actually never seen "Beauty and the Beast" but would love to be able to watch it with my daughter. I love her explaining her love of books. I can relate! I like where she sees the library. I can't believe 25 years has passed. This was always my favorite Disney movie and Belle always my favorite princess. Beauty and the Beast came out 25 years ago already? I can't believe it! Love the costume!